It sure is funny what you find on outings! I went with Brian when he deposited his check and we found a cute little store up in Kennett. They had healing kinds of things, and a mixture of art, jewelry and even a lending library of wellness books. I told Brian to go back up sometime and pick me out something. We then went looking for a new geocaches. The hardest part with these were finding places to park. The one we didn’t really try to find had cars zooming by-I just didn’t feel like having people watch me poke around, so we went to one I tried to find in June and I could see it under this big electrical box from the car! I needed something at the Dollar General, but before we went in there, I hit the Habitat for Humanity resale store. The first thing I see is a sign that all Christmas items were 50% off! That included trees. So one really stood out-prelit with at least 400 lights and it had tinsel woven on the green branches. It was under $40 and I know this had to be over a $200 tree. We got the box and it looked new. 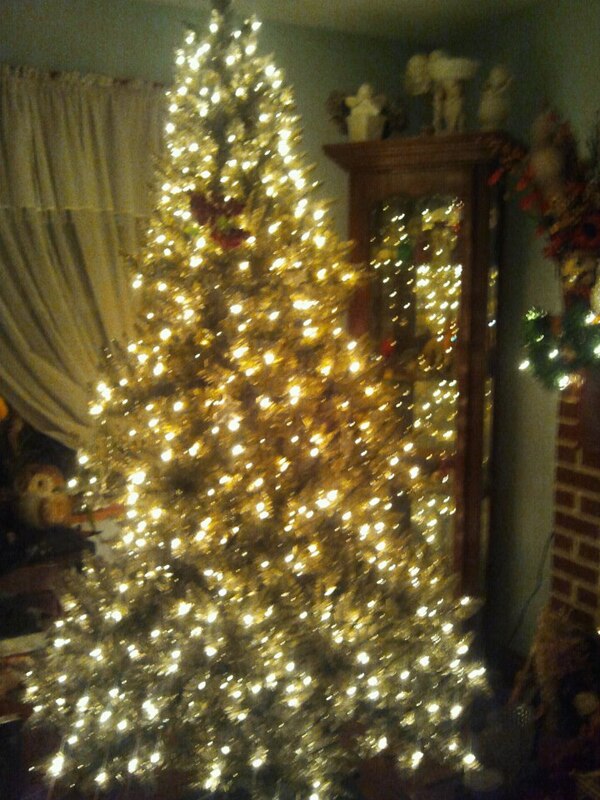 I will have to load it up with ornaments to cut back on the brightness. Right now I have both autumn stuff and the tree up. I’ve never had a tree up in November before! It took only a few minutes to get up too. I have to mess with the branches a bit. I was trying out some holly up near the top there. I’m really excited to decorate it. I have a lot of work to do to get it tidied up in the living room. I also received a big gift order and that box is in there too. Finally some Christmas spirit! Not feeling great as my hip and back had dampened my enthusiasm. I did go to the physical therapist and she thinks my issue is the ‘gel’ between my back ligaments that is all shifted to one side. I have to do a form of a push up several times a day, 10 times a session. That is killing my arms. I think it is helping a bit. My insurance won’t pay for the PT (it sure doesn’t pay for much, and has a rule about pre-existing conditions, which is crazy for people over 50). I went back to the church on Wednesday and the kids were mostly good. I’ve worked here 2 months now! We had my middle brother and our mom here on his birthday that night and I made yummy vegetable lasagna for dinner. The next day, Brian and I took Mr. Cosmo kitty to the vet for a check-up. He is a good weight for his age and is pretty healthy. But, she did take a peek at his teeth and said that a few looked like they needed to be extracted at $20-200 a tooth! He’s had a tartar issue all his life. I can’t see subjecting an old cat to anesthesia either. Signs he is having issues is eating really slow or chattering when he eats-he does neither, but I will watch him. I am still working on paying off my own dental bill. Geesh. Sunday evening I was invited to a ladies’ tea at the church. Sounds nice! Great bargain on the tree. It is so nice to have the lights already on. Enjoy decorating it!